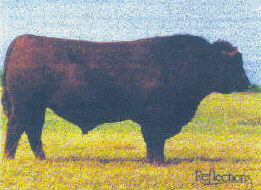 Dynamo 6Y was purchased as a calf from Flying K Red Angus in the fall of 1989. This bull consistently produced the most functional females in our breeding program. Other Canadian purebred operations succesfully used Dynamo 6Y in their programs. Dynamo 6Y was exported to Argentina during the summer of 1995. 25 years after his birth we are still breeding via AI to this outstanding sire. His daughters are a vintage of thier own. We have not yet found a bull who sires such deep and open ribbed females with flawless feet and legs. The Dynamo females have extreme longevity while producing alongside the best. Red Flying K Dynamo 6Y is a foundation sire who is still right for the times.